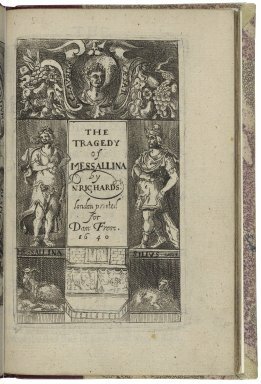 [letterpress title page; A3r] THE TRAGEDY OF MESSALLINA The Roman Emperesse. [engraved title page] by N: RICHARDS. [letterpress title page] Written by NATHANAEL RICHARDS. [letterpress title page] As it hath beene Acted With generall applause divers times, by the Company of his Majesties Revells. [letterpress title page] London Printed by Tho. Cotes for Daniel Frere, at the signe of the Red Bull in Little Brittaine. 1640. Title page imaged from Folger call number: STC 21011. Image is not from the transcribed copy.